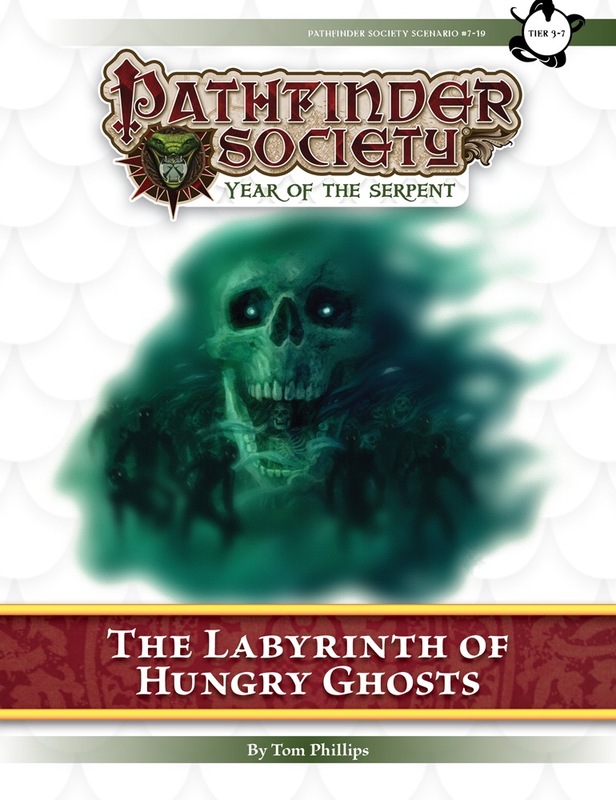 Following a successful mission into the mist-shrouded and shifting Gloomspires, the Pathfinder Society sent another team to explore the tomb of the legendary pirate Sevenfingers. Unfortunately, this team never returned. The spires have momentarily halted, allowing a new team to brave the tomb’s many dangers, hopefully rescuing their allies in the process. This scenario is a sequel to Pathfinder Society Scenario #6–06: "Hall of the Flesh Eaters". I'm glad we, as good pathfinders, made some sensible purchases based on what we were walking into. Without them, we wouldn't have made it. I have to say this was a very unique scenario, and I enjoyed it very much. On the other hand, half the table spent about an hour unable to act. Yes, it's a well-designed scenario, and an epic encounter, but any scenario that has players pulling out their phones and checking their social media can't get more than 3 stars. This also led to a very, very long game, over 5 hours. On the other hand, our final vengeance felt oh so sweet! I just finished running two tables of this online, and part of me wants to give this one 4 Stars because it really does have an interesting story and there are many elements to it I really enjoyed. But, at the same time, there are many things that make me want to give it 1 Star as well. In both games, I didn't really have a single character that was really ready for this scenario, which in itself is fine, but it did make a lot of things very difficult for the parties to progress or actually learn what was going on. Add to that that a great deal of the lore and general information is rather spread out, both tables complained of not really understanding what was going on throughout, (which to a degree was intentional). I did have to go through a lot of extra effort at the end to explain things, though, which was partially to so many failed checks, and partially because there are so many small hints that are easy to miss or forget. This scenario included a lot of combats that are designed to take players out of the action for long periods of time (at the table). From the Haunt that can go on for 10 Rounds to the potential to get possessed, (even with max protections up), to Color Spray to Mad Babble, there are just way too many Save or Sit This One Outs involved. The final boss is basically designed to say "Gotcha" to players that are supposed to be good at certain things, for the sake of making that antagonist be cool or something. This is terrible writing, in my opinion. Especially at this level range, Character's abilities, tricks, and tactics should not be arbitrarily removed or negated just so a story can play out the way the author wants it to. Good adventure design allows and encourages those abilities to work, not removes them from play so that their pet NPC can do stuff. One of the Boons at the end is very unclear as to how it actually works. It says that Characters receive one, and then says you have to buy it. Which is it. Do you get one for free, and then have to buy additional uses thereafter? While I did enjoy the overall theme and mood here, one thing I was a bit disappointed with was that there was not really a great deal of variety in encounters, and in one of my groups, we ran into an issue with how to handle an Alchemist vs so many Incorporeal enemies. A strict reading of the rules would have left that player sitting on the sidelines wasting all of his bombs repeatedly, and while not something directly the fault of this scenario, it is something that came up often and should be looked at. In the end, there is a lot of good here, but there is also a lot of bad here. The story itself is rather straight forward, but also very cool, but is really hindered by how little of it the party might actually find out, and the "gotcha" style that seems like the author was writing this to be very DM vs Player really hurt this one a lot. It was fun, but will most likely be remembered for the amount of frustration it brings in play. We played this scenario with a mixed group of adults and juniors. Our party was all level 4 and quite combat focused. The overall scenario story is o.k. and expands the story arc of the the mini triology. It allows serveral type of charcters to have their moments to shine, but I feel that following this ideas mislead the author to a point where certain classes are almost manatory. Playing this senario without any characters skilled in survival or performance or without at least one cleric or paladin is quite difficult. The enemys are all well prepared and their combat tactics unforgiving of player mistakes which results in quite deadly and crippling encounters. 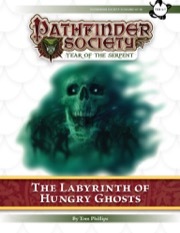 The advenutre penalizes the party heavily with attribute damage caused by undead and haunts, ending in a point where the monk had -10 Strength, the Rogues - 2 Strength and 2 negative levels and the fighter got possessed. By the mercy of the game master all wisdom damage went to a npc thus killing him that way. I feel this is way over the top for what a lower level group should expect to be confronted with. The mazes that are scattered throughout the dungeon cause lot of fatigue and exhaustion among the characters weakening them further. Together this results in a lot of long term debuffs that weakens the group to a point where they are no longer able to handle the anyway challenging fights. I cannot recommend this scenario to inexperienced players and a party without a bard and atleast a cleric or paladin. Like Hall of the Flesh Eaters, this scenario is a real stickler for theme. Lots of things that could be classified as "hungry ghost". Since this dungeon level literally had that name on the door (as described in Halls), it's one of the rare adventures where it's not that metagamey to buy equipment based on the name of the adventure you're going on. That's probably why the high-tier first encounter is annoying. It doesn't fit with the theme at all. It's otherwise interesting and challenging, but it just doesn't fit in with the adventure. When I ran this my enjoyment was a bit marred by an overly argumentative player with a trip-oriented build who kept trying to argue rules about why he should be able to trip things. Given the name of the scenario, guess how that went. Another thing that irritated me both while GMing and while playing was that the labyrinth is basically a bunch of rooms, with very little hallway leading up to them. In both cases, you're spending minutes, hours or days trying to navigate the maze and these rooms represent the spots where you encounter something particularly interesting. The way the map is laid out, there isn't really much room for players to position themselves outside the rooms, and the encounters tend to start with the assumption that the PCs just burst into the room and then the encounter reacts to them. But in both runs, the players kept asking for a way to "hear it coming" and be able to approach those rooms more cautiously. This could have been handled more elegantly somehow. Lesson for next time I suppose. The labyrinth navigation has been rather maligned by some people. I found the system a bit clunky, with a few too many layers of checks on top of each other, that could have been simplified to "assign one lead navigator, everyone else can aid, and these are the checks you can use". But on the whole it's a major improvement over the navigation rules in Delirium's Tangle where it felt like you were rolling on the Wandering Damage Table. This was much less grindy. The encounters themselves I liked; each one was different and several of them quite challenging. They had some startup problems due to players queuing at the door though. I didn't really like the mechanical design of the main boss; it felt like a bit too much of a custom monster with random extra defenses piled on to the point where it's really a crapshoot if you can affect him. I think I actually liked the "filler encounters" more than the main thread, which was a bit overused cliche. This scenario is primarily about combat, and it throws a number of well-written and tactically engaging battles at the party. Danger is tangibly present and your party will need to cooperate well, and the enemies are interesting. Other than that, the setting doesn't really materialize. The encounters appear to be unrelated to each other, and the titular labyrinth doesn't really do anything. Your characters walk through nondescript corridors for some time, then enter the next room and roll for initiative. I suppose this was meant to be creepy and atmospherical but it really isn't; and there's no tie-in with the other scenarios at the same location. There's no real opportunity for roleplaying, and no chance to explore the dungeon as there's never a choice of where to go next. Play this for an evening of good fights and showing what your character can do mechanically. Skip it if you're interested in story. Releasing at the end of the Month! Yesssssssss! Back to the Gloomspires! Hey, pretty sure my Gloomspire agents are in the right tier for this! Nice. I have yet to cross out that boon. I totally called that this would be a thing. Alas, my gloomspire agent is now level 15, so I'll have to bring someone else. I'm super excited for this! YES! I loved the last adventure, and have eagerly been awaiting a return to the Gloomspires.As an added bonus my Gloomspires character can still play this! The two new scenarios aren't downloading for me. Other files are downloading fine. The two aren't even personalizing. I think I can see the problem causing the download issues, but unfortunately cannot rectify it myself. I'm bringing it to our tech team's attention to address, and hope to be able to provide an update soon (likely not tonight). Also having the same problem. Been trying to download them both for a couple hours now. Ultimate Intrigue downloads fine, but the two scenarios won't. Yup - pretty clear we still have a problem. Considering when I'm running this next I'm wondering if we have an ETA update. Heh problems always seem to happen when I plan to run a session for a brand new scenario. If it happens again next month I'm going to feel Desna has cursed me. That evil and vile Desna will never help you. Only the glorious and almighty Asmodeus is capable of bringing happiness to someone. Our Tech Team has put in a temporary fix so folks can now download this new scenario, but are still working to isolate the root cause and get it corrected. Sorry for the inconvenience there folks! 1• Would a PC's animal buddy trigger the ghost bites just by walking in the maze? This would pretty much automatically kill them, since the minimum travel time is 1 hour.